Dr. Ralph Cinque (retired chiropractor) was born and raised in New York City, but he went to high school and college in Southern California, the latter at UCLA. He studied Chiropratic in Portland, Oregon at Western States Chiropractic College. His professional focus has always been on weight loss, nutrition, and supervising fasting. A vegetarian since age 19, he has long had a keen interest in health, fitness, and life extension. Dr. Cinque is well known for being one of the most experienced fasting practitioners in the world, having been doing it since 1976. He did an internship with Dr. Herbert Shelton at his famous health school in Central Texas, 15 miles north of San Antonio, and also with Dr. Alec Burton, the Osteopathic physician who for many years operated the Arcadia Health Centre 30 miles north of Sydney in Australia. For many years, Dr. Cinque operated the Hygeia Health Retreat in Yorktown, Texas, in which a former hospital building was converted to a different purpose. And after that, he operated a smaller fasting retreat at his home in Buda, TX where people came to lose weight, overcome bad habits and addictions, and to improve their general health. Dr. Cinque was one of the original founders and is a past president of the International Association of Hygienic Physicians. He is the author of Quit for Good: How To Break A Bad Habit. 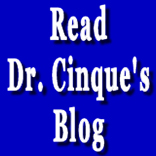 In his personal life, Dr. Cinque enjoys being a grandfather, and he is an avid bicyclist, a piano-player, and he is very earnest about trying to grow his own fruits and vegetables.